Sword Art Online has without a doubt become a huge series outside of Japan thanks to A-1 Pictures producing an anime last summer. Thanks to the massive interest in the series Yen Press have licensed the original light novels for release outside of Japan. I’ve picked up the first volume to review and see how much the source differs from the anime! Every arc of Sword Art Online light novel series is split across two books. 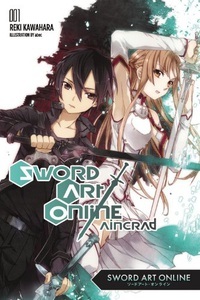 The first volume of Sword Art Online explores Kirito’s time in Aincrad from when he and many others first become trapped within the game before time skipping ahead to when him and Asuna first joined up in a party. When compared to the anime, which took a load of short stories from the second volume of the light novels and put them at the beginning of the anime series, it’s not a bad skip. I know the Sword Art Online story well enough to know that the more interesting aspects for me are later on in the plot and skipping out all the side stories that the anime shoved into the beginning works better. Overall the light novel does a lot of things better than the anime actually did. Kirito’s thoughts and feelings are better portrayed and he’s not so much an ultimate player who can defeat anything that comes along. Asuna on the other hand is made out to be a more vulnerable character than in the anime, being shown to rely on Kirito a lot more emotionally than the anime ever really digs into. She’s shown to have more emotion than the anime gives her and although she’s definitely portrayed as a weaker person for it, it still gives her more depth and makes her more interesting. As mentioned previously, missing out on all of the short stories that the anime moved from the second light novel to the beginning of the series really doesn’t hurt the story. The first light novel explains the characters and situations and flows in such a way that losing the stories that fit in the middle of Kirito’s time in the game doesn’t hurt it. For example, the book makes brief references to a few events that the second volume later covers in its collection of short stories but explains these past events in enough detail so that the story still makes sense to first time readers. Not exploring all these side stories early on also means that we’re free to complete the end of Kiritos’s time in Sword Art Online in one book. It’s written in such a way that the story will hold you captive until the very end. You want to know who survives and who doesn’t, and you want to see if Kirito and the others really will make it out of this game of death on their own. In the afterword the author, Reki Kawahara, comments on how Sword Art Online was his first novel and how it isn’t his best written work. In a lot of ways it isn’t but because we know this, and because I know the quality of his writing gets better as he goes on, it’s easy to ignore some of the mistakes a newer writer may have made with his first work. Sword Art Online has a lot of logical gaps and problems with a few of the things it does, which carried over to the anime. Looking past its fault though, the first light novel is an enjoyable enough read. While it perhaps isn’t the best introduction to the Sword Art Online world it’s most definitely of note to any moderate fans of the series. The anime is still the best introduction to the series, despite its faults, but the first light novel gives us a nice sense of beginnings. We can see where everything started and how it has progressed over time. It also gives us the chance to fondly look back at the first arc in the series. Overall Yen press have done a brilliant job with their translation of the book, as always, which makes the book a joy to read from start to finish. They’ve also added in some colour pages at the beginning that are a nice treat for fans of the series. I’m certainly looking forward to reading more of the novels as they’re translated and released, especially once we hit arcs which have yet to be turned into anime. Sword Art Online volume one is a fun start to the series and while most definitely not how I recommend people get into the Sword Art Online series, I’d definitely highly recommend it to existing fans. The Sword Art Online anime explores the world of Aincrad better than the first volume of the light novels does. This is partly due to the book focusing on the end of Kirito’s adventures and saving the short stories for the next volume, and partly because it’s trying to introduce us to all the characters and finish the story up rather quickly. The anime has more time overall to do both, so for people getting into the series for the first time that is the better bet. This entry was posted in Light Novel Reviews, Light Novels, Reviews and tagged Light Novel, Review, Sword Art Online on 27th July 2014 by Demelza Ward.